Just a quick note today to say congrats to Tom Beaver of the UK for his outstanding performance at the London Marathon. He was using it as a training run for an upcoming race we are prepping him for and he ran in the 3:20's ! He said the next day he felt great, and ready to run again ! Awesome job, Tom ! I am asked quite often- how do you run that many miles? What do you eat ? Are you insane ? Conditioning your body to ultra races requires a good training program and lots of rest !!! Actually, the rest is of extreme imortance. After I do a long run on the weekend I follow a regular protocal. First I run 40 or 50 k on trail with my race gear, then immediately following my run I eat a higher glycemic carb so that I can start my recovery for tomorrows run ! That means I usually take a gel while I am cruising back to my place. Then its stretching for 10 minutes and then I have a shake which is a mix of protein, omega fats , greens and l-glutamine. After that I sometimes ice my legs and then get in a hot shower. Then it's nappy time for 30 minutes or so. When nap time is done I then eat, eat, eat ! So, it sounds like alot of stuff to do- but it works for me ! Let me know what you do ! Clients In The News !!! Mike Scherman of Saskatchewan won 1st Place at this year's Yukon Arctic Ultra ! I won this race in 2004 and I can promise you it is insanely tough ! 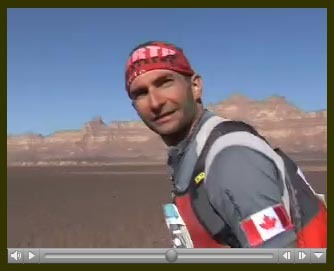 Lorne Webernuk of Ontario completed his first ultra- the AR50 in California a few weeks ago. He ran the 80 kms in 11:38- in mud and steep hills ! JF Carrey is currently in the icefields getting prepped to attempt a summit of Everest. Go JF ! Mimi Anderson of the UK- she was fast and now is getting even faster- watch out Ultra World !!! Mark Babinski of Quebec- incredible finishes all year nordic ski racing - and heading into marathon season primed up. David Leenen- 1st Place last week at Gloucester Spring Skate figure skating competition. Back from Libya and Training for Gobi ! Lisa and I are prepping for Gobi as we have with all of my other races- lot's of miles ! Since Libya I have beentraining pretty much non-stop. I was fortunate to have a fast recovery- I was running within days of finishing. I was really happy with this as I ran almost 200 kms in super duper tough terrain and barely had any swelling and no blisters. Some of the credit has to go to the Goji Juice for sure. The plan for Gobi so far has been to train as I did for Sahara Race. It was awesome to get those base miles in Libya. Training for Gobi will/has included speed work, hill repeats and the ever present 'tire dragging'! Running with Kevin and Charlie means running really fast- and Gobi is a stage race so it is going to be super tough and super fast ! Where Libya involved more or less non-stop running for 32 or so hours, Gobi will be over a course of several days with the long stage (minimum 80 kms) peeking out on day 4 or 5. I am always asked - which is tougher- stage racing or non-stop ? I think for me it is stage racing. So fast and not enough time to recover between stages. RacingThePlanet races are incredible experiences- legendary for their course design and ability to test your limits- I am sure Gobi this year will carry on that tradition ! Stay tuned - more to come !